While I’m trying to like how these features work, I am struggling with dynamic UCS. I'm still trying to understand how it affects some of my customizations. 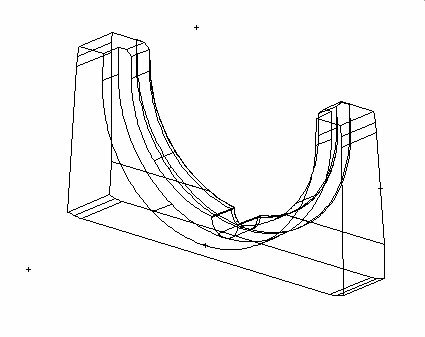 For instance, one function restricts movement to a specific axis. If I want to move objects only in the Y-axis from picked points, it’s supposed to only move on the Y-axis. Sometimes things go wacky and the objects move unexpectedly and the value that is echoed back to the command line shows X or Z values. Perhaps there are other factors, such as Osnaps affecting it. I suppose that I'll eventually figure it out, but for now I'll just think of it as a ghost in the machine. An old friend of mine is the Blipmode command. As it is now in AutoCAD 2015, it's a zombie command — it exists, but it's not as easy to just turn it on. I dug around and discovered that I could redefine it in my ACADDOC.LSP by adding (command “redefine” “blipmode”) to get it working again. I use the little blips as a visual confirmation for pick points, often as a clue to where on the screen I picked for a selection window. If I mistakenly selected a location, I know not to select the same spot again. Now AutoCAD displays a colored window as you begin your selection, blue for contained selection, green for crossing, and a new cool colored Poly Drag mode. Along with enabling selection preview, these can make it easier to select objects. The blips do still come in handy to see that I correctly picked the endpoint of a line or the quadrant of a circle, etc. T (that’s me) loves blips — they can make it easier to select objects. Another old friend is the Aerial View command. Not many users were familiar with this little tool and I suspect that's why it was discontinued. Like Blipmode, you can redefine it, but when I did, the viewer did not display the screen graphics in the viewer window. On the other hand, now that I've gotten used to AutoCAD 2015, I don’t miss it like I thought I would. Believe it or not, Release 14 did not let you zoom in and out with the mouse wheel. For the most part, that's how I’m now navigating large drawings. In fact, you should see how muscular my stubby dino finger is. Side note: Did you notice that the Explode ribbon icon with a stick of dynamite has been replaced with an image of a broken apart cube. Really? Bring back the dynamite image! So, enough reminiscing of old dead things, what’s new that’s exciting to this old Dinosaur? For one, the right-click menu that pops up when you select an object. 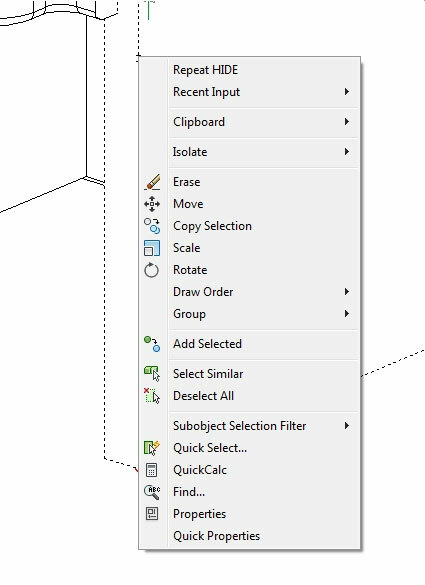 My number one favorite tool is the ability to hide objects (Isolate / Hide Objects) which initiates the Hideobjects command (introduced in AutoCAD 2011). Or, you can select to isolate selected objects. If I need to see hidden objects again, it’s just another right click away. Additionally, there are commands that are available from the menu; a list of recently used commands and input, clipboard functions, filters, properties, a powerful integrated calculator. I find the calculator especially useful. One of my favorite new tools is the menu that comes up when you right-click on an object. This little brain of mine gets so easily distracted! I was talking about all things dynamic and I planned on talking about another new-to-me AutoCAD feature, dynamic blocks, and how I plan to put them to use. Alas, my time is running out for now, so I must leave that subject for another date. In closing, old habits can be hard to break away from. Although some may still hold value, I continue to be surprised at how much more efficient the new environment can be. 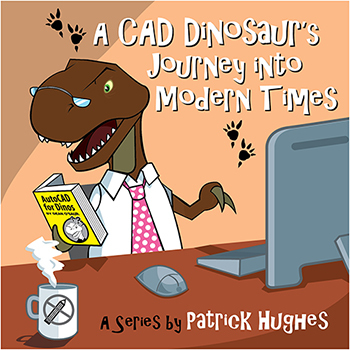 In the past, I’ve always thought that customization was key to delivering greater efficiency, but I’m discovering that AutoCAD 2015 has many of the tools I need right at my fingertips — just the ticket someone with tiny arms!